Send us a copy of your menu and we will create a custom, fully functioning website designed for your restaurant with downloadable samples for your print menu for you to test drive. Use the "Request the Restaurant Information Pack" form at the bottom of this page and add the words "Free Offer" in the Affiliates Name box. 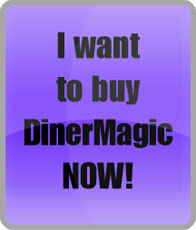 Along with the Restaurant Info Pack, instructions will be sent on how to receive your free demo DinerMagic website. DinerMagic is a tool that will help busy restaurant owners, chefs, or managers save precious time and money and use it where it's really needed, running their restaurant. How does DinerMagic do this? By incorporating your restaurant's menus and website into one easy-to-use interface, where you can easily edit and instantly print your restaurant's menus while at the same time it updates your online menu. You no longer have to wait weeks for costly updated menus to come back from the designer or printer. There's no shipping charges and no waste. Too, with DinerMagic you have a professionally designed website for your restaurant with an online menu, photos of your dishes (if you choose), contact information, map and directions to your establishment, a photo gallery of your favorite pictures, a guestbook, and more. And it's fully functional and ready to use. There's no programming involved, no HTML to learn, no graphic designing. In fact, no special computer knowledge is needed. We're the computer experts and we do all of this for you. If you haven't received one yet, you can download a brochure by clicking on the DinerMagic Brochure link to the right. Or you can request an Restaurant Information Package by filling in and sending the form below. Or call us at: 541-412-0254. You want to save time. Who has time to install software and learn to build websites? With DinerMagic you have a fully-functioning, professionally-built (by us!) website in just days. Updating DinerMagic is simpler than sending your tech support guys an email. Who has the time to pick through hundreds of menu templates and then choose artwork when you have a perfectly good menu to begin with, a menu that identifies you and one that your customer's are familiar with? However, if it's time for a new menu, no problem. We can design one for you. You want to save money. The price of food is changing daily. What if you need to change just one menu item? Do you have to print all new menus? What's that going to cost? DinerMagic allows you to make an edit, click a button, download and print only the pages or menus you need, one or thousands. There's no waste, no delays, no fuss. What more do you want? You want to make a good impression. No, let's rephrase that: in today's competitive market, you need to make an outstanding impression. You want to be found. You want new customers to find you. You want a professional web presence. You don't want your hard work and your restaurant to be judged by a poorly designed, unfinished, or out-of-date website. You want current, professional menus. You don't want penciled-in or scratched-out prices. Worse, you don't want to be subsidizing your customer's meals with outdated prices. You want to spend your time doing the things you want to do. You want all of this without spending a lot of money. We know this and we've kept DinerMagic amazingly affordable. Start saving your time and money now. For the important things. The Restaurant Information Pack includes case studies, a sample of a before and after menu that we did for one of our customers, frequently asked questions, and more. Please request one by filling and submitting the form below. There's no obligation. In fact, we won't even contact you. You don't have to provide your phone number or email unless you want us to. *If you were referred to us by one of our affiliate resellers, please enter their Name here.